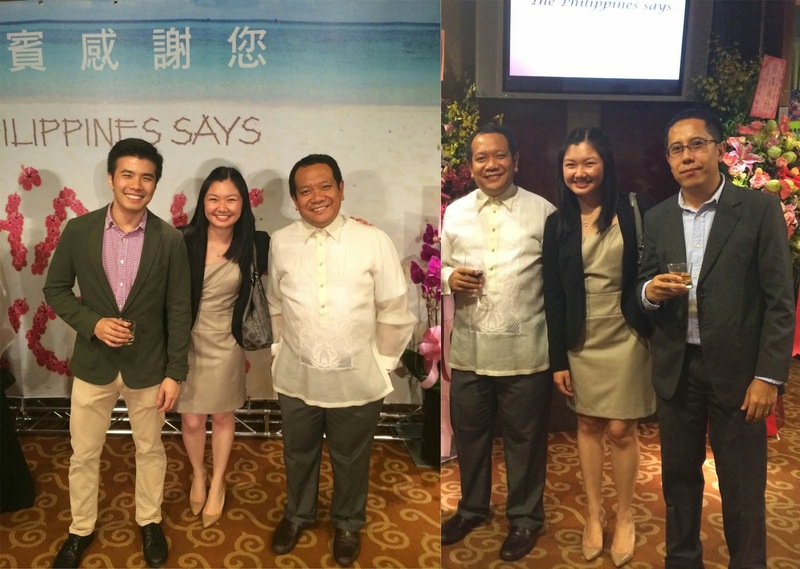 Last Thursday, I was invited by the Manila Economic and Cultural Office (MECO) to attend a cocktail party in celebration of the Philippines' 116th Independence Day. MECO is the representative office of the Philippines to Taiwan in the absence of bilateral ties. This year's celebration is pretty memorable after the Taiwan-PH rift last year, when our coastguard reportedly shot a Taiwanese fisherman. Amb. Basilio, MECO's resident representative in Taipei, said Taiwan-PH relation is now back to normal after having gone through the most severe test (Side note: The Ministry of Labor Affairs almost did not approve my work permit application at the time. They stopped processing Filipino work permits from May to August because of the conflict.). The Independence Day celebration was held mainly to give thanks to Taiwan, for all the relief efforts and donations they have extended after Typhoon Haiyan. Fellow Filipinos gathered at the Shangri-La Plaza and enjoyed a feast of Filipino cuisine. It was nice seeing many familiar faces- those we usually see in Zhongshan (which we refer to as Little Manila), or at churches with Filipino communities, even the people working at remittance centers, to our Filipino-Chinese doctors. We enjoyed the desserts- turon, sapin-sapin, mango tarts, leche flan and the halo-halo bar. They also served salpicao, camaron rebosado, beef roast, and lechon de leche. There was a raffle draw where several airlines gave away roundtrip tickets to Pinas, and the grand prize was well, a flat screen TV. My former colleague from China Post could have won the raffle, but because he left early, they had to re-draw. I wanted to go up the stage and claim it on his behalf but my boss was around hehe. My churchmate, Ate Era who works for Dominican School, won the grand prize and I'm pretty sure the TV's on its way to Manila now. The Bukas Palad Choir flew from Manila and was invited to perform 3 sets. My friends and I were singing along the entire time and caught some Taiwanese glancing and smiling at us. Yes, we grew up listening to Bukas Palad songs, kulang na lang sumayaw din kami nung kinanta yung "I Will Sing Forever." I had a nice week, and hoping to have a nicer weekend. Here's what I'm doing now- brunch in bed. What a lazy Saturday. Lastly, I just wanna share a photo of our Strawberry Cheesecake Frappe, which Starbucks should rename as "Diabetes in a cup." And because sharing is caring, we had to split the calories too- we ended up dividing this into 6.
i laughed on your 'diabetes in a cup' comment. sad but true! haha! I'm glad you were able to celebrate our Independence Day in Taiwan without the issues faced by our fellowmen in Singapore. @Rea Thank you, Rea. Yes I'm glad the rift is finally over, otherwise all OFWs will be affected. @Angel Haha! It was like eating burger and fries, calorie wise. @Kristine True. I dont understand why some Singaporeans are so close-minded. My last McDo meal was Saturday. I bought my daughters some happy meal toys so I had to help them finish the food too. Haha. My girlfriend just tried the frap today and she initially didn't know the difference between it and the usual Strawberry Cream frap. Me: "Baka yung whipped cream lasang cheesecake."